Browse our wide variety of antique chandeliers, sconces, and table lamps. We restore and rewire all our lamps in our repair shop to ensure that all lighting will operate properly. From crystal chandeliers to bronze sconces, we have the right vintage piece to to complete your decor. We have beautiful dining sets and retro love seats for your remodeling projects. 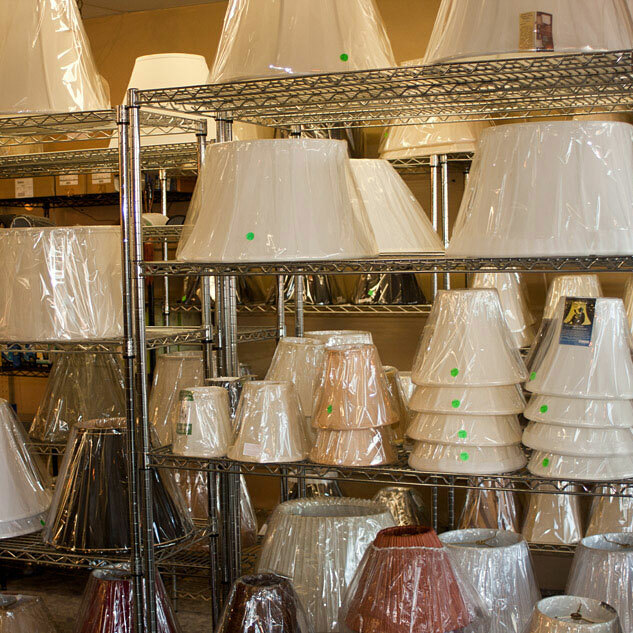 Our large stock of lamp shades will enhance the look of any lamp. Bring your lamp in and find the right shade. Want something truly unique? We can make a wide variety of custom lighting to suit any size project. From small kitchens to 20ft high ceilings we can build for any scale. If you need to recreate or resize a fixture you already like, we can do that as well. All we need is a photo of your project and the desired dimensions. With laser cutting equipment, we can cut out a wide variety of unique patterns. Outdoor lanterns are a great example of this. Celebrating the form of nature, our rustic tables and benches are one-of-a-kind. Each slab of timber is hand chosen for it’s beauty. The raw wood is then aged, sanded, and sealed allowing the natural grain of the tree to show. A wrought iron frame is created to hold the wood. We use mainly Oak, Maple, and Pecan to construct the tables and benches. Call us today for a consultation or contact us to see which pieces we have in stock.